The exhibition, “The Speed of Darkness and Other Stories”, is going on at the KUMU art museum in Tallinn, through September 30. On the day that Western scientists revealed to the world that they have quite possibly discovered the so-called “God particle”, otherwise known as the Higgs boson, I was at KUMU, winding my way through the dark recesses of consciousness. And I mean literally dark, because the walls of the museum's fifth floor have been painted black and there's barely any light to see by. The group exhibition, “The Speed of Darkness”, which was on view in Turku last year, is now showing in Tallinn, albeit with some new additions, which is why the title has been expanded to include “Other Stories”. But in truth, there is only one story here – the powerful metaphor of “darkness”, which irritates those same scientists when used in the term “the speed of darkness”, which in turn, hopes to encourage artists and viewers to find a new facet to the sombre word. Of course, the “speed of darkness” doesn't exist, because in physics, darkness is just the absence of light. Complete darkness doesn't evolve; it doesn't move; it isn't measurable; it just is. 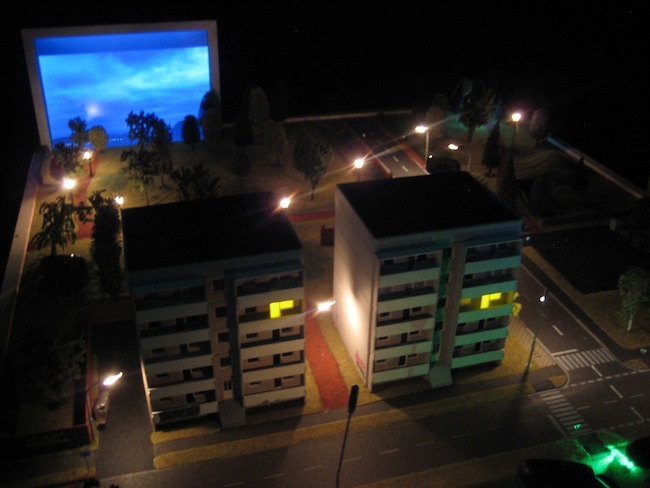 For instance, the Estonian Karel Kopliments (1986) has created a miniature model of a neighborhood consisting of bleak apartment block-buildings, titled “Suburbs of Fear” – there's no one left on the streets, just a faint, yellowish light and flashing traffic signals. The artist Timo Toots (1982), from Tartu, has made a huge, mechanical remote-control console – “Electron” – with huge dials and gauges, and a panel on which Estonian cities are indicated with red light-bulbs. 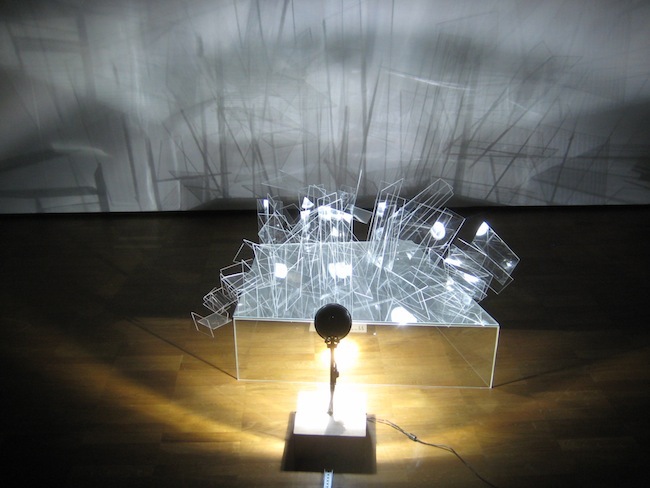 Although the artist's intention was to show the innumerable levels of our modern-day lives, similar to the way that electricity surges out from a plug to operate a complex system, the apparatus itself seems like a clear example of a now-defunct governing power whose effects continue to stretch into the present. Of course, not all of the artists speak about socialism's reliquaries, but the proportion who do is surprising. The Latvian participants in the exhibition have chosen to portray different aspects of “darkness”. Katrīna Sauškina's short-film, “Memories and the Speed of Forgetting”, is a story about choosing the right road, and the answers given by characters that inhabit dark peripheries, such as fortune tellers, magicians and soothsayers, and even passionate preachers. For her part, Kate Krolle studies the aesthetics, characters and mechanisms of fear employed by horror films, as seen in her work “Dreaming Wolves. Unknown Pleasures”. The dividing walls of the smallish room are painted with a dark forest of birch trees, among whose naked trunks appears an intermittent video projection of a girl with long hair; she frantically searches for something, and then encounters something in the woods. 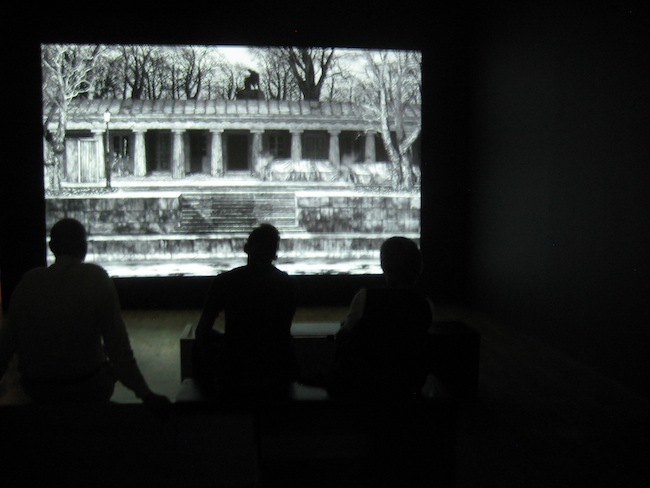 The only bright room in the KUMU exhibition contains a temple of hope. Built by Ivars Vermejs (1982), the assembled shack embodies the 1960's “hippy” way of thinking, combined with that of today's Occupy Movement; in other words, belief in the possibility of building a new future. But the prevailing atmosphere of the piece – which is enhanced by an estranged voice coming through a loudspeaker and giving instructions on how to exist in such a temporary structure – isn't all that hopeful. Considerably more optimistic is the video work by the Finnish artist group, IC-98, who also took part in Basel's young artists' fair, Volta 8. The piece statically illustrates a 19th century public building in a Turkish city. Through the effects of hand-drawn animation, the building gradually grows over with vegetation, even though in reality, it has spent long years in the cross-fires of the real estate market and is currently privately owned. 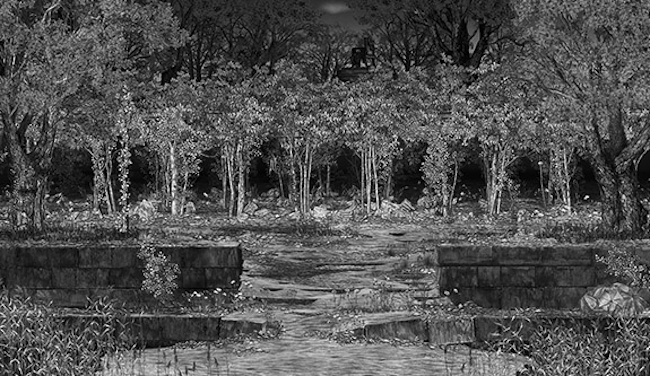 But in the scenario brought to life in the work of art, the forgotten ruins become verdantly green, allowing for the coming of the day when the world will experience a discovery on the magnitude of that made by Copernicus – proof that there is divine order at the base of the Universe.